Perhaps after years of working with natural materials and colors, it is not surprising that at some point I would find myself attracted to bright colors. The inspiration came from our recent trip to Korea which was a feast for the eyes as well as the other senses. Not to mention the hospitality we were shown by Narae Kim and her staff at the Seongnam International Book Art Fair and the warmth and friendliness of the people. One of the gifts I received was a fan with a butterfly painted on it. The butterfly is an important symbol in Korea and represents happiness. 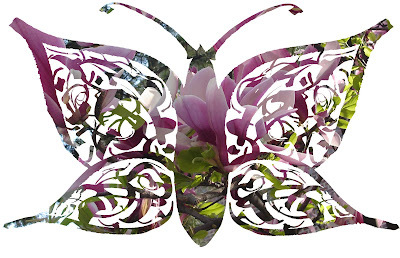 I combined an ink drawing of a butterfy with a photograph of a magnolia I took near the entrance of the Whanki Museum in Seoul to create the image above. It's a bit rough but I think there are possibilities.